Product #20469 | SKU 1SKB-R4U | 0.0 (no ratings yet) Thanks for your rating! The 4U Roto Rack Rack Case from SKB provides solid protection to rackmount equipment for musicians and pro-audio engineers. The rotationally moulded polyethylene case ensures strength and durability, while the recognisable bar design signifies the 4U rack size on the front and rear covers. The recessed steel twist latches with front and rear rubber gaskets ensure the cover's tight seal against moisture and dust. Internally, the front and rear steel rack rails provide up to 44.7 cm of depth and allow for gear to be mounted from the front and rear for added stability during transport. Heavy-duty polyethylene plastic flush-mount handles are used for ease of transportation, while interlocking ribs permit secure stacking when storing rack cases together before transport. 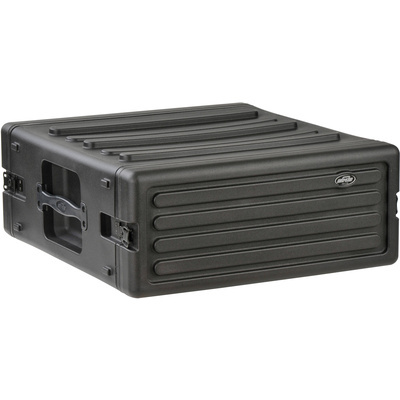 The case ships with a bag of 24 rack screws and hex-nut clips for racking your equipment.